The male cardinal’s characteristic crest and bright red color makes it one of the most easily recognizable birds in North America. While most people know a male cardinal when they see one, few realize that is that he is also a doting partner and father. Unlike many other species, cardinals are monogamous and may form long term relationships where both males and females share in raising the young. The light brown color (with red highlights) of the slightly smaller female cardinals provides camouflage to protect her from predators such as larger birds and cats as well as from egg thieves such as chipmunks, blue jays, crows, and snakes. Like the males, they can be identified by their characteristic crest and black face mask. The babies of both sexes are similar in coloring to the females but with less red and lighter colored bills. Though some live to age 15, the average cardinal lifespan in the wild is three years. Male cardinals feed females so the females don't have to leave the nest, increasing their chicks' chances of survival. Male and female cardinals work together to collect nesting material for cardinal eggs. While the male may bring her much of the material, the female does most of the nest building. Cardinal nests typically take three to nine days to build and are used only once. While the birds frequently raise two broods each year, they build a new nest each time. Sometimes males engage in a courtship in which he offers a female seed, even before they establish a nest. He will then continue to bring her food both before and after she lays eggs. Male cardinals are especially attentive parents and have even been seen feeding young of other bird species in addition to their own. After the female lays the eggs, she remains on the nest to incubate them for 11 to 13 days. Her brown color allows her to remain undetected by predators and helps keep the young safe. During this period, the male brings her food. When the chicks hatch, the male may continue to feed the female. Both parents feed the young for the next 25 to 56 days until they learn to feed themselves, or the male may tend to the young while the female starts a new nest. Cardinals eat mostly seeds, grains and fruits. They sometimes eat spiders and insects, which is almost exclusively what they feed their young. Their strong beaks enable them to crack open even hard seeds such as those from sunflowers. Both male and female cardinals are vocal throughout the year and have a variety of calls. 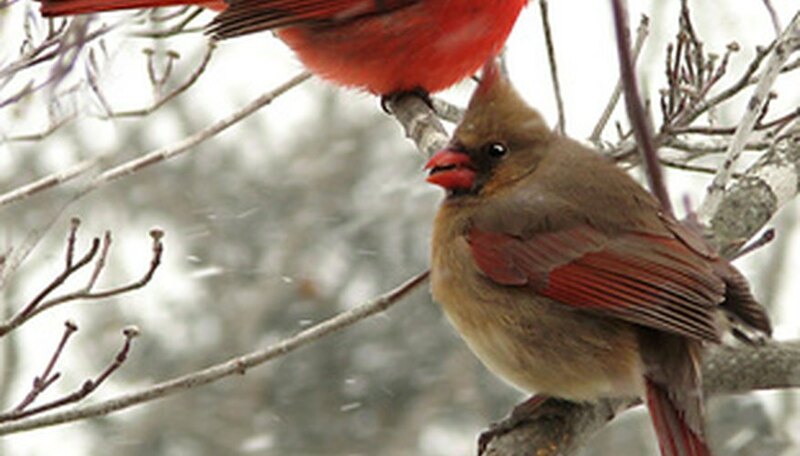 Some scientists believe that a female may use one of these calls while on the nest to notify the male that she and their baby cardinals need to be fed. You can attract cardinals to your yard by providing food, water and shelter. 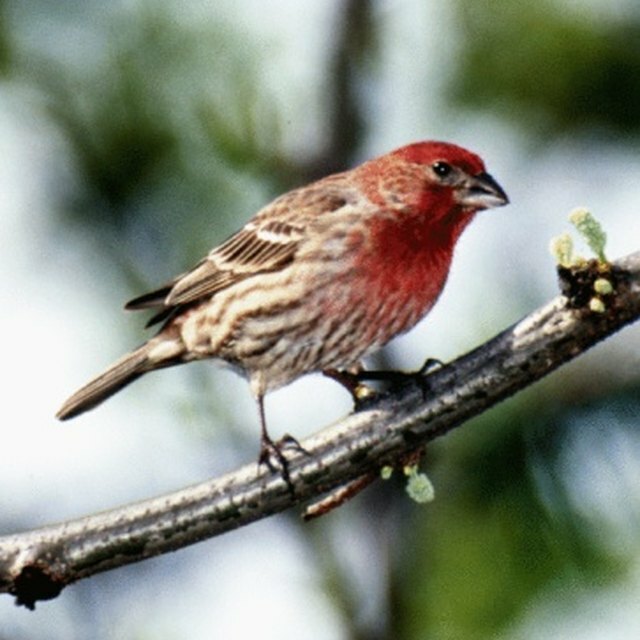 A variety of seeds, such as sunflower, safflower and cracked corn, as well as apples or peanuts on a platform or hopper feeder near shrubs or other protective foliage will entice the birds. A birdbath or other water feature nearby will provide water and a place to cool off in the summer. Cardinals prefer to build nests in dense bushes or shrubs such as thickets or evergreens. They do not migrate, but instead stay in the same territory year round. Yavorski, Kimberly. "Why Do Male Cardinals Feed Female Cardinals?" Sciencing, https://sciencing.com/do-cardinals-feed-female-cardinals-6569113.html. 27 August 2018.